Homemade baby quilts are one of the most treasured of all gifts that a close friend or relative can present to a newborn baby. 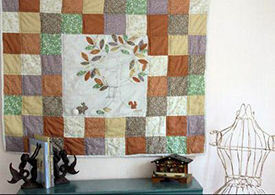 A quilt is a classic baby soother and are often carried until they are reduced to little more than rags. On this page, we have examples of handmade patchwork crib quilts made my loving friends, parents and grandparents that took time from their busy schedules to cut and stitch pieces of fabric into something lovely. Such gifts are treasures and we all would love to give such an item to a new baby but what are we to do if we have never learned to sew and do not know one end of a quilting needle from the other? So many of us would love to spend more time around the quilt frame, but don’t have the time to spend weeks working on a single gift for a newborn. Thankfully, there are quick and easy tied quilts that are great for beginners. to get started even if you are a beginner that has never operated a sewing machine. A crib quilt made from a combination of flannel baby fabrics in buffalo plaid and stripes is an excellent choice for a rustic nursery. Choosing the right fabrics for a crib quilt is no different than making a fabric selection for nursery curtains, the baby bedding or upholstery. Considerations should also be made for the room's color scheme, whether the quilt will be on display in a baby boy nursery or a baby girl nursery as well as whether or not the piece will be kept as an heirloom or for everyday use. A patchwork border surrounds appliqued squirrels and bunny rabbits on this project that can either be used as a crib quilt or a wall hanging in a forest theme nursery with woodland animals. Are you looking for a pattern or do you have a picture of quilt or a favorite pattern that you would like to share? Only the lucky crafters get to work from home and spend their time dreaming up new designs for crib quilts. The average mom has to buy quilts ready made, but the good thing is that there are lots of pretty, handmade quilts for sale online. You can buy handmade quilts from samples or from looking at galleries of pictures on baby websites like this one or you can pick out your fabrics and have a nice addition to the baby bedding that you chose. Many seamstresses will allow you to choose your favorite quilt pattern from many examples or you can provide ideas for appliqués in themes that would fit with the nursery theme and décor. Often there will be picture galleries or albums of completed baby crib quilts to help you find your favorite. Handmade quilts are a nice addition to the baby’s main crib set. On chilly nights, it’s so sweet to snuggle in the nursery rocker with an infant that’s been wrapped in a soft, warm quilt. When the days and nights are warm, the crib quilt becomes part of the nursery decorations. For this reason, the fabrics used to create your crib quilt should be a close match to baby bedding and nursery window treatments. If you can’t locate an exact pattern match, at least try to find fabrics that will blend with the nursery’s color scheme. It’s true that some crib quilt patterns work well with modern fabric prints as well as vintage or antique prints, but there are exceptions. 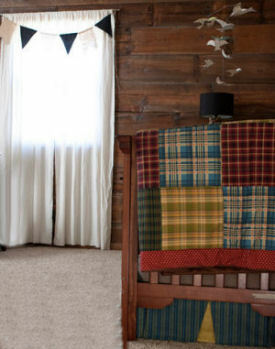 For instance, a large, bold print in primary colors might not be shown to full advantage in a Log Cabin quilt design. As the opinion of an experienced quilter if you are worried that you aren’t qualified to match a particular print with a particular pattern. Ask any quilter and they will tell you that the cost of the materials is a minute portion of the equation when pricing baby quilts. You won’t think that crib sized quilts are so expensive when you deduct the price of fabric and notions and then divide the remaining amount by the number of hours spent on labor. If you want a unique baby gift that your friends will treasure, give precious handmade baby quilts. If you’re looking for a cheap gift, a homemade quilt may be out of reach but please don’t discount the love and labor that goes into the creation of these beautiful pieces of fabric art. Please make plans to visit us often to see the latest pictures of homemade baby quilts shared by visitors to our website.